Omid John Afati is a proud American-Iranian. Born and raised in New York, Omid had a unique childhood growing up in a post-911 America. His appreciation for the United States grew even more when his family received unconditional love and support of their friends, neighbors, and fellow Americans despite the unpredictable relationship between the United States and the Islamic Republic of Iran. In 2012, Omid graduated from University at Buffalo with an undergraduate degree in Business Administration and a minor in Marketing. Thereafter, Omid enrolled at California Western School of Law and was later admitted to the California State Bar in July of 2017. Since his admittance, Omid has been practicing in one of San Diego’s most prominent law firms, focusing on resolving probate, real estate and corporate issues. 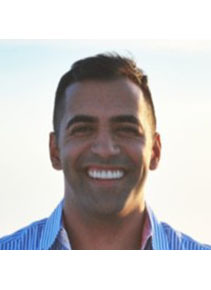 Now, Omid spends most of his time practicing Trust Litigation and Estate Planning. During his free time, Omid enjoys traveling and exploring the outdoors. Omid has set foot on five of the seven continents, visiting countries like Spain, Germany, Turkey, Iran, China and Morocco. When he’s between the Pacific and Atlantic Oceans, you can find Omid hiking or backpacking on the great American outdoors, wrestling with the will of Mother Nature.